As I’ve said before, when I travel I eat. More specifically, I bakery crawl. I look up every bakery within walking distance of my hotel and I try to visit as many as I can. Often I’ll spend double digits on pastries and muffins and cookies, just to take a bite out of each; I consider it research. Last month, when I went to Santa Monica, Holly and I took a long walk through LA neighborhoods to try Gjusta, a local bakery. It was your typical 1 mile LA walk: from trendy hotels and palm trees through residential streets filled with cute homes mixed with condos, BMWs and Audis parked all over the streets and homeless encampments on every corner. We were just starting to get a little nervous when, out of the blue, Siri told me we’d arrived. It looked like a warehouse from the outside, but when you opened the door it was like another world; a world that smelled like fresh baked bread and pastries. The first item in the bakery case was a Baklava Croissant. I think it’s one of their specialties and it was so unique I had to try it. It was layer upon layer of flaky pastry (so flaky I looked like I showered in croissant confetti after I ate it) filled with a sweet baklava filling. It was heaven, and before I’d even finished my first bite I knew I was going to make them at home. When I got home I got right to work making my new favorite breakfast pastry: the Almond Baklava Croissant. 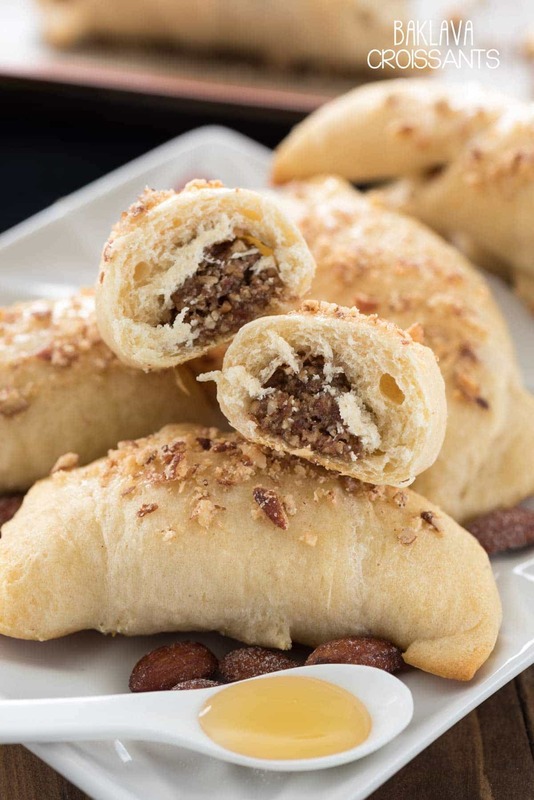 Once the almonds are chopped and mixed with some cinnamon and honey it tastes like a delicious baklava filling. I rolled my filling up in crescent roll dough, but you can also use puff pastry if you want a more traditional croissant-like texture. Either will work! The other thing I love about baklava is the honey drizzled all over the top. It’s ooey-gooey and sweet, and I wanted these croissants to have some of that feature, but still be somewhat portable. If you’re serving these for brunch, you want people to be able to grab one easily, right? So instead of pouring syrup all over them, I just brushed the tops with honey and sprinkled more almonds over the top. 4 ingredient Almond Baklava Croissants. Is there anything better?? Also – these Almond Baklava Croissants are so easy to make your kids can probably do it (with dad’s help chopping). Just leave the printout on your husband’s desk…maybe he’ll give you a Mother’s Day surprise?? 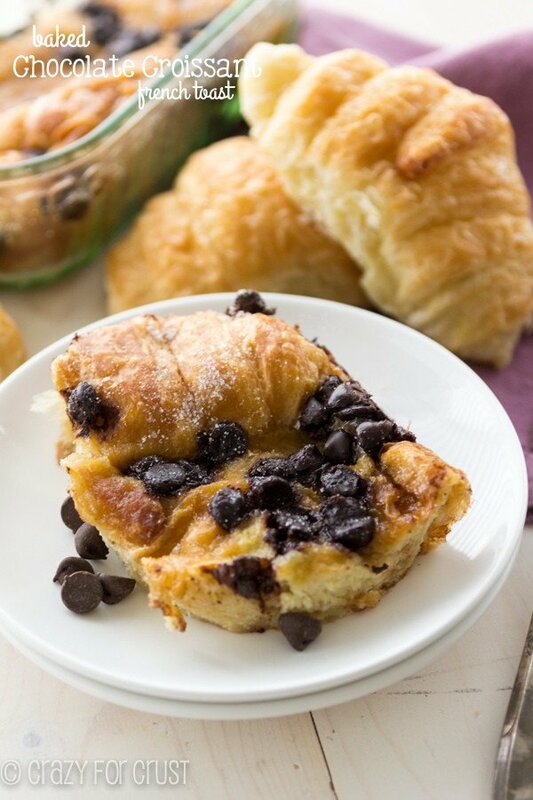 Make Almond Baklava Croissants for breakfast or brunch! 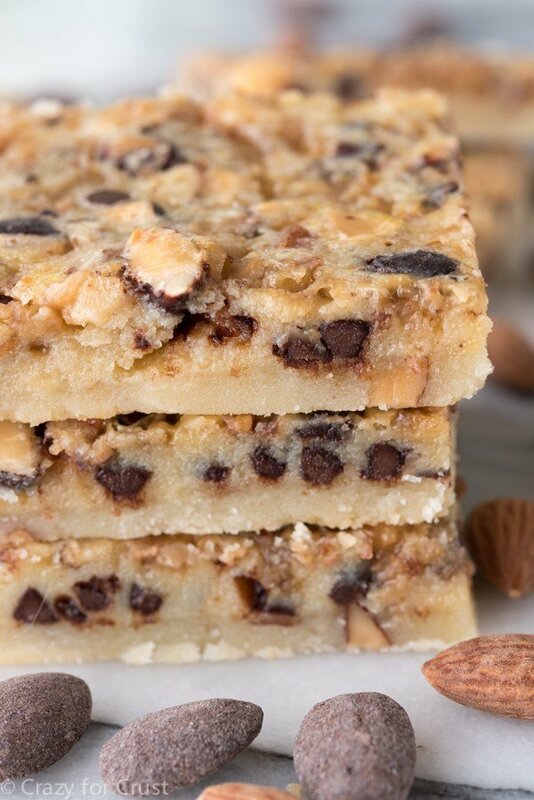 This EASY recipe has only 4 ingredients. It's baklava in croissant form! Finely chop the almonds (a food processor is helpful for this). Reserve 2 tablespoons for garnish. Stir together finely chopped almonds, cinnamon, and 2 tablespoons of honey to make a thick paste. Unroll and separate the crescent rolls into 8 triangles. Divide the almond mixture among the crescent rolls, placing large tablespoonfuls in the thick end of the triangle. Roll tightly and place on prepared cookie sheet. Bake for 11-14 minutes, until golden brown. Let cool before glazing. Note: glaze just before serving. To glaze: heat remaining 1 tablespoon of honey in a small microwave safe bowl for just a few seconds, until it’s more liquid. 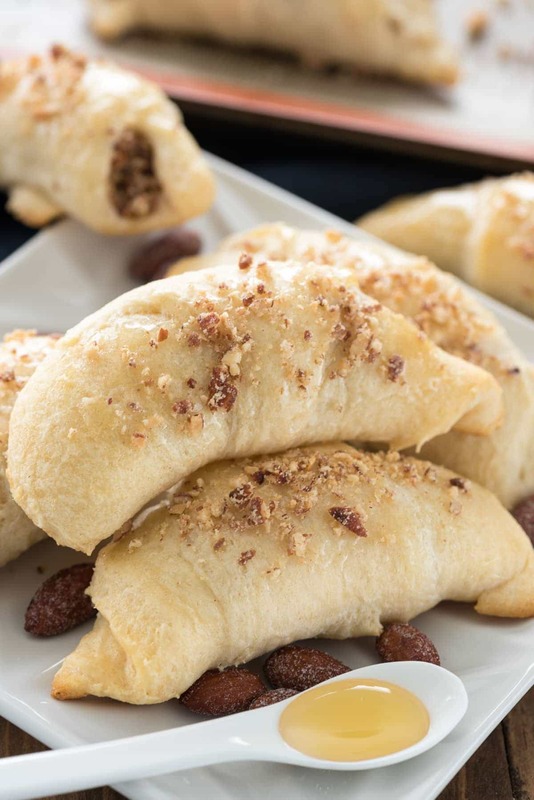 Brush onto the tops of each crescent roll and sprinkle with reserved almonds. Store in an airtight container for up to 3 days. These are best stored unglazed (it gets sticky). You can also freeze unglazed croissants for up to one month. 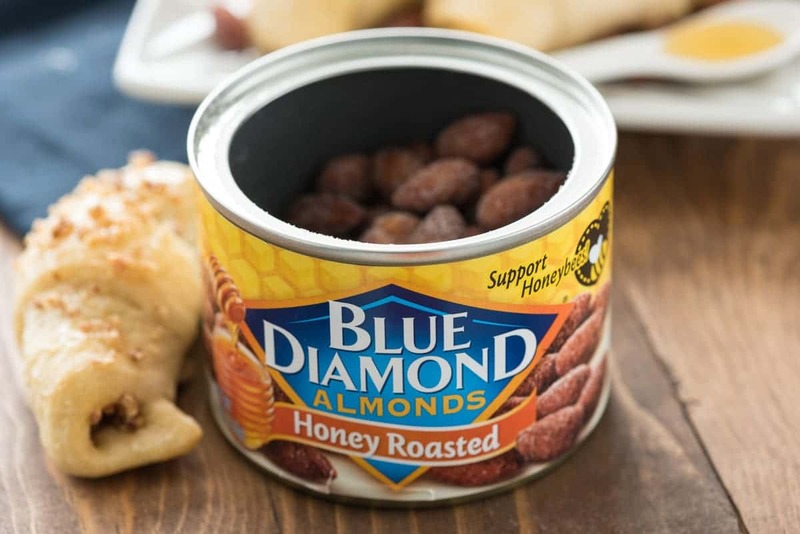 This post has been sponsored by Blue Diamond Almonds. All opinions are 100% my own. 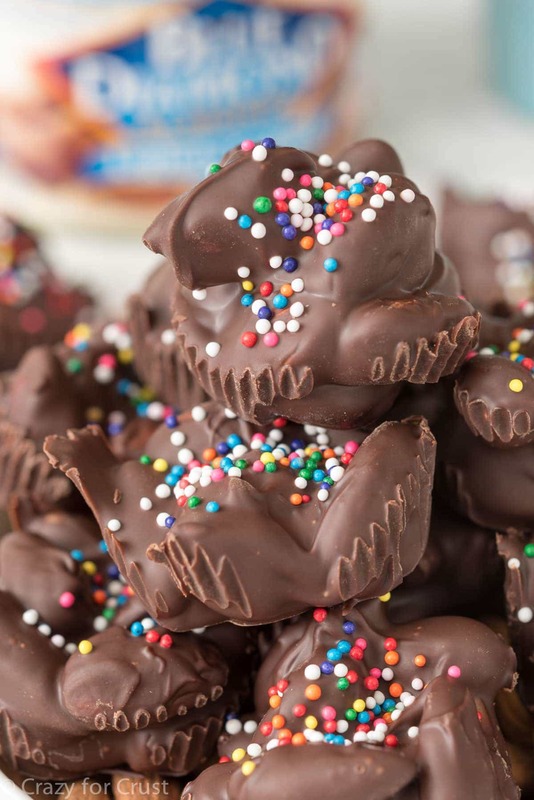 Now these look delicious and like something my whole family would love! Love that it uses the flavored almonds! honey roasted almonds? I’m going to have to find those. If they’re as good as the honey roasted cashews I’m addicted to I’ll be in heaven. I wish I got to make these in class rather then peeling apart 15 layers of pyhllo and building up the baklava that way. Wow Dorothy, these look incredible! I wish I could reach through my computer screen! That sounds so fun to do a bakery crawl when traveling. I’m up for the challenge. Next vacay! This is BRILLIANT! I have always wanted to make Baklava, but who the heck has time for that? Love this super simple incarnation!